I picked up this old, peeling and rusty ice cream maker at one of my favorite San Clemente finds, La Casa Verde for only seven bucks! I added Senechio, Jade, Sedum Angelina, and Sedum. After only two months, it’s thriving in the new habitat. 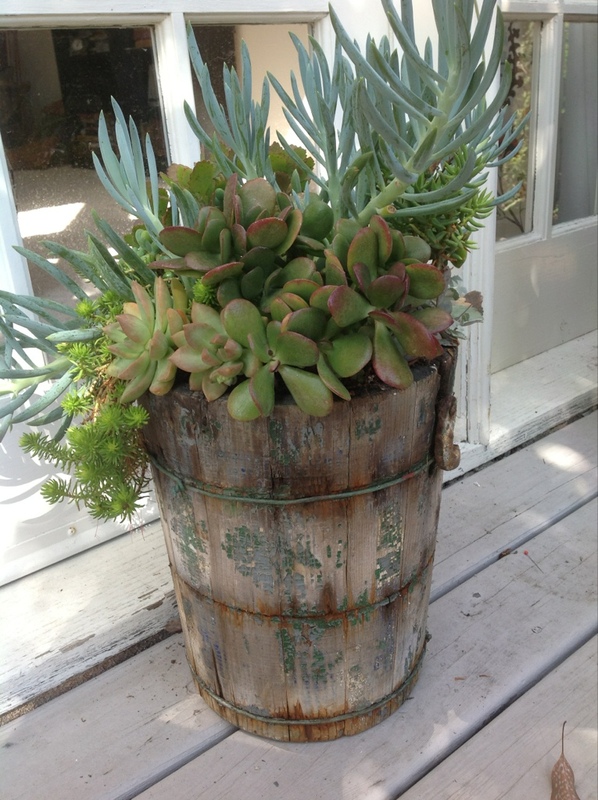 Do you use potting mix just for succulents? I love the whole recycling concept these days. No need to use cactus mix; regular potting soil is fine. I also use a lot of spanish moss in the bottom and on top to keep it from compacting. Just don’t overwater. I love that you are reading my blog! When are you going to start yours? You could have quilting, painting, dog and frisbee events. Spanish Moss interesting, never heard of doing that. Maybe next time you repot you can show a tutorial ?So much fun to grow things year round,feel so blessed.